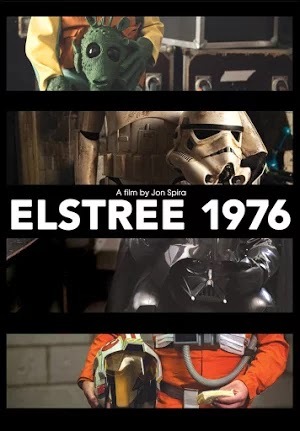 The idea behind “Elstree 1976” is a pretty good one. The title refers to one of the filming location in North London and the year the film was being made. Director Jon Spira sits down with a handful of extras and lesser known actors, who had a small part to play in “Star Wars,” to let them tell their experience working on the film. As a fan of the podcast “I Was There Too,” in which Matt Gourley talks to extras and people behind the scenes about their experience working on major films, I expected this documentary to be along the same lines. Actors get to tell their fun stories and share secrets from within the industry, and reflect on how being associated with these big films has changed their lives. To be fair, there is some of that to be found in “Elstree 1976.” However, far more often it plays like a series of intercut biographical featurettes. It begins with the extras telling where they were born and briefly delves into how they became actors, and eventually meanders its way to life after “Star Wars.” Though occasionally interesting, rarely does the film find the sort of interesting pieces of fan trivia or stumble upon insightful reflections on the work fans might have been expecting. It isn’t helped by the fact that Spira rarely breaks the talking head format. It’s a fairly dry and visually uninteresting format, but it begins to work better the longer it goes on. David Prowse is by far the most well known of the actors on hand. He, of course, gave the full performance as Darth Vader, even if his lines were dubbed over by James Earl Jones. Spira also sat down with Paul Blake (Greedo), Jeremy Bulloch (Boba Fett), John Chapman (unnamed X-Wing Pilot), Anthony Forrest (Fixer, Storm Trooper), Laurie Goode (Hrchek Kal Fas, Stormtrooper, X-Wing Pilot), Garrick Hagon (Biggs), Derek Lyons (Massassi Temple Guard, Medal Bearer), Angus MacInnes (Gold Leader), and Pam Rose (Leesub Sirln). Yes, you’d need to be pretty familiar with “Star Wars” in order for those character names to mean anything to you. The parts range from unnamed background filler, to unnamed characters with a few lines of dialogue, to having their faces completely obscured by some of the most iconic helmets ever created. Nevertheless, because “Star Wars” is so well known, these people got to take part in some of the most iconic scenes in film history. The shortcoming of doing a documentary about a film from the perspective of a person who was around for five days and played an unnamed character with no lines is there’s little more they can add to the story of how the film was made. Most of the extras here are willing to admit it was just another minor job. Yet, there are already documentary style featurettes out there for those that were looking for a more comprehensive behind the scenes. Instead the majority of the runtime is devoted to how they got into show business, and ultimately pondering how bizarre it is that such a small role could lead to action figures and paid appearances at conventions around the world. The fact that “Star Wars” is such a huge phenomenon makes it one of the few film series ever created to have such a fervent fan base. Who else but “Star Wars” fans would be so willing to geek out over unnamed characters and the actors whose faces were obscured throughout the entire film. Even if I began to wonder why this film existed, by the end I realized it was for the ardent fans, the convention goers, and the memorabilia collectors. So in a way it did have more to add to the story. The people being interviewed became their own characters. They're so open and honest about their lives, they begin to feel like friends or relatives telling stories about how an important event shaped their lives. It's such an intimate documentary that it's hard not to like these people by the end. Spira let the film be about them rather than what they could add to someone else’s story. It never becomes the behind the scenes making of I was expecting it to be, but I’m glad it exists nevertheless.